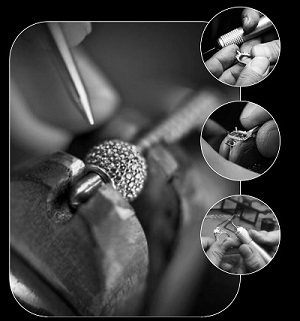 Adamas Jewellery has a uniquely distinctive and innovative product line. Great amount of research and developement takes place to build a product that will satisfy our customers and eventually the end consumers need. Our product consists earrings, bracelets (kadas), rings, necklaces, bangles and pendant sets. Conceptualization and production of our designs is done keeping in mind present and future fashion trends. Our extensive research builds a product line that will help our customers secure sales, and in turn help us sell better. Research done by our product developement center on current and future trends is reflected in our product line. Using state of the art technology like CAD/CAM, our designs our visualized in multiple dimensions before the first sample is created. CAD/CAM allows for the minutest details on paper to be perfectly represented physically. Knowing very well that what machines can do, man can do better, we also have a team of model makers ready to breathe life into designs created by our designers. We invite you to view a few of our creations, at our design gallery. We would also love for your to visit us at our production center. Our bespoke service provides you with the opportunity to be involved in every step of the creation of a one-of-a-kind piece of jewellery that is designed and crafted to your personal requirements. 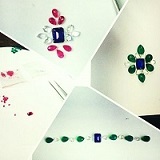 Please note that we are also able to special orders one of our existing pieces to your specifications. 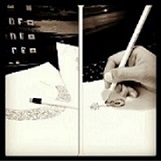 The journey begins with a consultation to discuss your initial inspiration and design ideas. Once we have established an initial design direction and proposed budget, we set to work, seeking out the finest gemstones and sketching out a series of design ideas that are unique to you. As soon as we have prepared the design sketches and procured a variety of gorgeous gemstones to show you, we meet again, working together to select the perfect gemstones and refine your final design. We then prepare a series of detailed technical drawings before it is directed to the CAD (Computer Aided Design) department. At every stage we ensure that your design is meticulously crafted to your specifications. The entire journey is documented and beautifully presented in a folder along with a full colour presentation drawing of the design, and concludes with an item of bespoke jewellery that tells your own personal story and will be treasured for generations to come. Precigem, the diamond arm and founding company of Adamas Jewellery, handles diamonds sales. 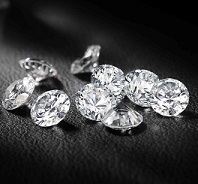 The main product line is between 0.005cts to 0.69cts in Round brilliant cut, Marquise and other Fancy shapes of White, Top Light Brown and Top Light Silver Cape colours. It is said each diamond is different but by using our own grading system and assorting into various categories, each diamond matches the others in every packet ready to be set into jewellery.